Let's face it, we need more ethical and environmentally friendly shoe companies. Who is leading the way in the shoe industry that meet the needs for vegans and sustainable fashion buyers? These next five shoe brands are leading the way in design, innovation, ethical, and sustainable footwear. What's on your feet today? Do they have ethical practices? Do they have repair services or reward programs? I have some buying to do this month! 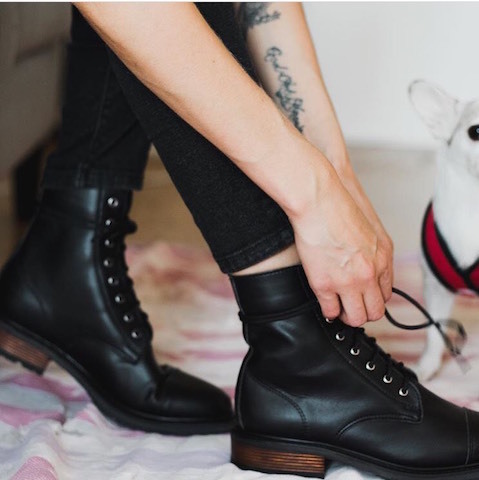 Check out these companies and find how they are shifting the fashion landscape with vegan footwear. 1) Rothy’s Shoes are made from recycled material using state of the art 3D printing knit technology, the yarn is post consumable waste certified PET plastic water bottles, and there’s a moisture wicking agent treated yarn so your feet stay cool and dry. Insoles are made from 100% recycled fiber and outsoles are carbon free rubber. Shoes are recyclable and at the end of the shoe life at their partner, Plusfoam.com. They recycle them. It’s a closed loop initiative in the sustainable fashion industry. Plus, if they get dirty you can always throw them in the wash. Hello, tech and fashion has arrived now! 2) Nicora, a shoe company coining the word, “Kind Leather” made from natural and recycled fibers and no plasticizers, PVS, or animal products and essentially, vegan material. These shoes are non-toxic and long lasting made in a solar powered zero waste emission factory in Massachusetts. The latest collection makes me want to buy now instead of waiting for the holiday rush. 3) Oka B is another closed loop shoe company that houses their shoes in Buford Georgia. Shoes are made from 15-25% of recycled material and prides itself on maintaining a closed loop approach and made in America brand. Can this brand’s vision get any better? 4) Bhava is a ethical footwear company designed for today’s professional woman with a variety of footwear including: sandals, boots, pumps, bridal and so much more. Founder & designer, Francisca Pineda created a footwear company with ultimate craftsmanship and design utilizing organic, recycled, and cruelty free components. Alongside vetted manufacturing partnerships, Bhava is a timeless brand to check out. 5) Nae, a shoe company using recycled airbags, Pineapple leaves (Pinatex) -thank you Dr. Carmen Hijosa, PET recycled (recycled plastic bottles and recycled tyres), natural cork, microfibers of nylon, polyester and cotton all certified via OEKO-TEX. The Portugal company’s mission is vegan shoe wear making sustainable footwear the ultimate priority. They want to be known for the alternative in Portuguese footwear. They have collections for men and women and their strategy is to utilize vegan materials, use ethical partners, and integrate environmental practices in their process. So next time, you are shopping and looking for an alternative shoe brand that's vegan based with ethical and environmental practices in their supply, look no further. These brands are showing how to walk the talk one shoe collection at time. Have any further suggestions on vegan brands? Feel free to suggest in the comments below or your experiences with other vegan shoe brands. Would love to hear your suggestions. Also, feel free to sign up for Nomada Company's e-newsletter as we are looking to more changes soon with our website and you can catch insider behind the scenes as we move forward with the handbag collection. Thanks for stopping and don't forget to look for great discounts on the e-newsletter as well.